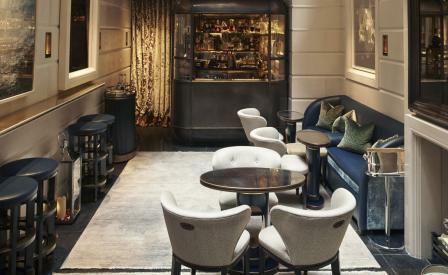 With the launch of its compact and beautifully bijou Champagne Room, the Connaught in Mayfair stylishly affirms its status as one of London’s most prestigious hotels. Accessed via a velvet curtain, this intimate space, crafted by interior designer Guy Oliver, features a palette of neutral shades and lavish blue undertones, a splendid limestone floor, and plenty of tactile leather and lustrous brass. Meanwhile, the tiny room is illuminated by a large skylight, graced by a life-size bronze sculpture of a diver in motion by artist Sophie Dickens. A selection of seductive cocktails are on offer, but for the full VIP experience, we recommend perusing the list of 40 vintage champagnes, served, naturally, in Baccarat crystal glassware. This is a true hidden gem on London’s booming bar scene.